Tokyo Japan’s rapidly aging society, where nearly one in four people is over 65, means that more elderly are living alone every year – and also, sadly, dying alone, their bodies sometimes undiscovered for days. But now, local authorities are teaming up with groups such as the post office to check in on senior citizens, increasing their human contact and actually improving their lives. Tokyo’s Shinagawa ward, where last year at least 25 elderly died alone in their homes, in August began a venture with Japan Post in which postmen check up on people over 65 once a month by handing them seasonal greeting cards. How cool is that? I wonder how that would go over in our country where we live in such a fast paced society and everyone is so consumed with themselves. Their goal is to strengthen ties within the community, says one welfare official. The experimental program calls on postmen to make sure nothing is out-of-sorts when they visit the homes of the elderly and to contact a special center at the ward office if in fact something is wrong. In that case, that office will contact hospitals and local welfare officials when needed. Last year, 4.6 million elderly lived alone across Japan, and the number of those who died at home rose 61 percent between 2003 and 2010, from 1,364 to 2,194, according to the Bureau of Social Welfare and Public Health in Tokyo. There is great reluctance to interfere in the lives of others, even those living nearby, and that means that these people are alone and some may go through their days without ever talking to anybody. There are those that say that the once Japanese tradition of respect for the elderly and tightly-knit communities are no more and that results in an increased isolation. A few other creative approaches are being taken to keep in touch with senior citizens in Japan. One Realtor has started promoting “house sharing” by single mothers and senior citizens, which brings together senior citizens who are interested in renting space in their house after their own families are gone with single mothers in search of affordable housing and also, perhaps, a live-in babysitter. But this type of thing is not without its problems because although single mothers are young and more flexible in the idea of sharing their house it’s a little harder for the elderly folks to accept the concept in the beginning and seems harder for them to adjust. 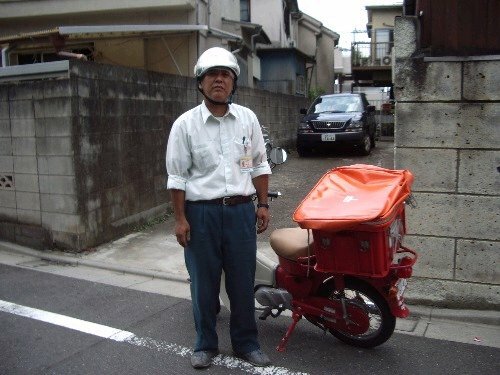 These delivery folks are often the first to find elderly customers who have died, as many as five to six a year. In the end, the simplest solution may just be trying to reach out and stay connected. I’ve been told that one flaw in the Japanese society is that they don’t even look each other in the eye when they’re walking in the streets for fear of interaction. I suppose it’s just customary. This entry was posted in aging, caregiving, eldercare, elders and tagged aging, caregiving, checking in on seniors, eldercare, elders, elders in Japan, Japanese customs, Japanese senior citizens, senior citizens, taking care of our seniors, the postman always rings twice. Bookmark the permalink.